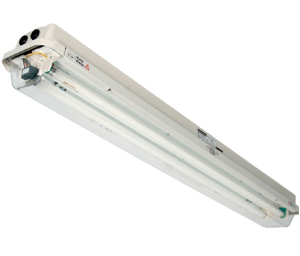 The Protecta III hazardous area Ex e fluorescent luminaire is designed for use in Zone 1 areas The rugged Protecta combines high quality and low maintance. It is constructed of a glass reinforced polyester (GRP) body and a polycarbonate diffuser to resist highly saline and other harsh, corrosive environments. Major features of the luminaire are the strength of the enclosure and mounting points together with the very high degree of ingress protection afforded by the simple reliable construction. All the control gear is mounted on a gear tray. This ease of access to lamps and control gear ensures that installation and maintenance will be completed quickly and efficiently. End of Life (EOL) protection to IEC 60079-7:2006 with EOL I and EOL II functionality. 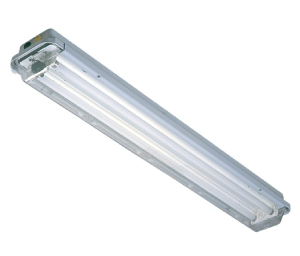 The Protecta III Ex e emergency luminaire is a technologically advanced and high quality fluorescent suitable for use in Zone 1 and Zone 21 hazardous areas. The luminaire incorporates comprehensive self testing features to ensure lamp, battery and supply integrity. The Protecta construction has a glass reinforced polyester (GRP) body and polycarbonate diffuser, this makes it highly resistant to saline and corrosive environments, ideal for use on an Offshore Platform or FPSO. The Protecta fluorescent is available as both maintained and non-maintained versions. During emergency operation light output can be up to 50% of one lamp with 90 minute duration as standard. Other key features of the luminaire include extreme durabilty due to the rugged enclosure design and toughened mounting points together combined with very high ingress protection. The Protecta's simple construction ensures ease of access to lamps and control gear making installation and maintenance both quick and efficient.